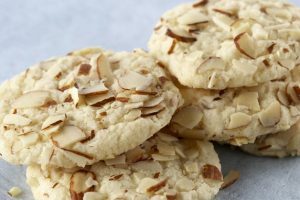 Cookies – Axelum Resources Corp.
Preheat oven to 375ºC. Spray 2 cookie sheets with nonstick cooking spray. In a medium bowl, combine the flour, salt, Fiesta Coconut Milk powder and baking soda. In a large bowl, with an electric mixer, beat the butter and the strawberry sauce until creamy. Blend in the sugar and vanilla. Beat the egg. Gradually beat in the flour mixture. Cover and refrigerate until chilled, about 30 minutes. Divide the dough into quarters. Divide each quarter into 9 equal pieces. With lightly floured hands, roll each piece of dough into a ball for a total of 36 balls. Spread the almonds on a large plate. Dip one side of each cookie ball into the almonds, pressing gently so the nuts adhere. Place the balls 1 inch apart on the cookie sheets. Make an indentation with a generous ¼ teaspoon of the jam. Bake the cookies, in 2 batches, for 9 –11 minutes, or until the cookies are just barely colored on the bottom. Transfer to a wire rack and serve when cool.